Strawberry is the 6th most important agriculture commodity in California, contributing to 88% of the fresh market and 94% of the processed strawberries produced in the US (USDA-NASS, 2012). According to the Pesticide Action Network database, 9.3 million pounds of pesticides were used in 2009 in California for controlling pests, diseases, and weeds (www.pestinfo.org). Arthropod pests such as lygus bug, thrips, twospotted spider mite, and whitefly are among the important targets that require a significant amount of pesticide applications. Finding effective non-chemical alternatives is essential for ensuring environmental safety and sustainable pest management. Since some of the non-chemical solutions can be less effective or slow in their activity compared to some of the chemical pesticides, a strategy to maximize the potential of all options is essential. A large scale field study was conducted in Santa Maria in an attempt to incorporate a neem-based botanical insect growth regulator, azadirachtin and an insect-killing fungus, Beauveria bassiana into strawberry IPM. Combining or alternating these materials with chemical pesticides can be a practical and more acceptable solution in providing effective pest management as well as reducing chemical pesticide usage. Before going into the details of this study, here is a brief introduction to azadirachtin and microbial control. Azadirachtin is a secondary metabolite in neem (Azadirachta indica) seeds produced from the seed cake that remains after extracting neem oil. Azadirachtin is a tetranortriterpenoid which is similar to the molting hormone, ecdysone and its homologs in insects. Azadirachtin blocks these hormones and interferes with the molting. Azadirachtin may also act as feeding deterrent. Microbial control is a part of pest management that involves using microorganisms that are pathogenic to arthropod pests. These microorganisms include bacteria (e.g. Bacillus thuringiensis and Serratia marcescens), fungi (e.g. B. bassiana, Isaria fumosorosea, and Metarhizium brunneum), viruses (e.g. nucleopolyhedroviruses and granuloviruses), nematodes (e.g. Heterorhabditis bacteriophora and Steinernema carpocapsae) and other such organisms that control pest populations. In general, each group of pathogens is specific to or effective against a particular type of pest. Entomopathogenic fungi like B. bassiana are especially ideal for sucking pests such as the lygus bug, a major pest of strawberries. 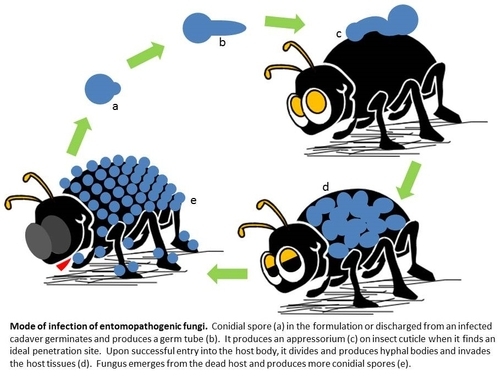 Unlike entomopathogenic bacteria and viruses which need to be ingested by the target pest, fungal pathogens cause infection when they come in contact with their host. Entomopathogenic fungal spores can germinate on various surfaces when there is sufficient moisture. When they come in contact with insect cuticle (skin), they produce an appressorium or a penetration peg and enter the insect body through mechanical pressure and enzymatic degradation of the cuticle. Upon successful entry into the host, fungus multiplies as hyphal bodies, invades the host tissue, and causes mortality. One conidial spore is all it takes to cause infection for most fungi, but arthropods have their own immune system and try to ward off the invaders. In reality, infection is usually caused by multiple spores which increase the chances of invasion. Dead arthropods either stick to the plant surface or fall off the plant and fungus emerges from the cadavers producing more spores for further infection. Both azadirachtin and B. bassiana are commercially available for both organic and conventional agriculture and are effective against several strawberry pests or similar species (Ludwig and Oetting, 2002, McGuire et al, 2006, Pearsall and Hogue, 2000, Quesada-Moraga et al, 2006, Shi et al, 2008, Von Elling et al, 2002). Additionally, Central Coast weather is ideal with its mild temperatures, foggy conditions, and condensation on plants is favorable for insect pathogenic fungi. Botanical and microbial control options can be an excellent addition to the IPM program especially when controlling lygus bug with chemical insecticides alone has been a major challenge. Since microbial control agents have a different mode of action than chemical pesticides, they can take longer to cause pest mortality. Fungi like B. bassiana take 2-3 days to infect and kill their hosts and this is comparable to the time that chemical insect growth regulators such as novaluron take to reduce pest populations. In light of promising results from preliminary studies (Dara, 2011), large scale field studies were conducted on fall planted strawberries in 2012 with a particular emphasis on lygus control. 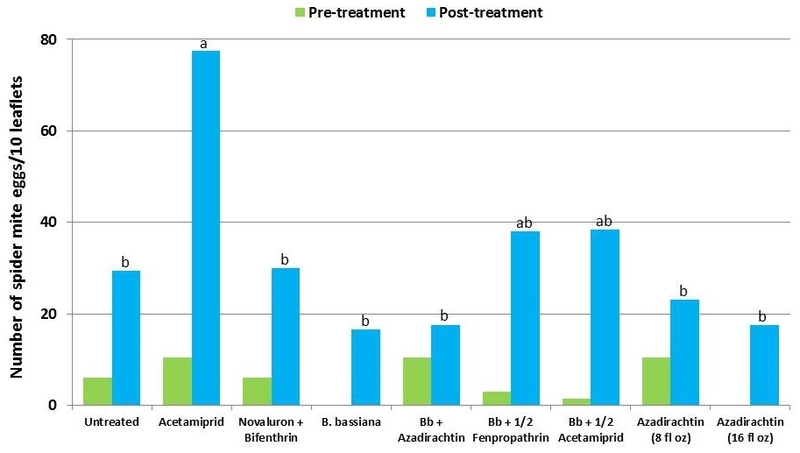 A field study was conducted with chemical insecticides (neonicotinoid, pyrethroids, and insect growth regulator), and B. bassiana alone, in combination with azadirachtin and reduced rates of two chemical pesticides. The combination of azadirachtin and B. bassiana targets both nymphal and adult stages. Chemical pesticides at reduced rates help weaken the insects and improve infection by B. bassiana. This study was conducted on a conventional strawberry field at Manzanita Berry Farms. Cultivar PS-4634 was transplanted in November, 2011. Treatments included, i) untreated control, ii) acetamiprid at 3 oz/ac, iii) novaluron at 12 fl oz/ac + bifenthrin at 16 oz/ac, iv) B. bassiana at 2 lb/ac, v) B. bassiana at 2 lb/ac + azadirachtin at 8 fl oz/ac, vi) B. bassiana at 2 lb/ac + fenpropathrin at 5.3 fl oz/ac (half the label rate), vii) B. bassiana at 2 lb/ac + acetamiprid at 1.5 oz/ac (half the label rate), viii) azadirachtin at 8 fl oz/ac, and ix) azadirachtin at 16 fl oz/ac, all in 50 gallons of spray volume. Each plot was 75' long and 7 beds wide and replicated four times in a randomized block design. Treatments were applied using tractor-mounted spray equipment on July 31, August 8, and August 15. Observations were made 5 or 6 days after each spray application to monitor lygus bug, twospotted spider mite, whitefly, thrips, aphids, and various natural enemy populations using standard sampling protocols. Big-eyed bug, damsel bug, lacewing, lady bug, minute pirate bug, parasitic wasp, and spiders were the natural enemies that were recorded during the observation period. It should be noted that not all chemical treatments in this study were meant to be effective against all target pests, but pest counts from all treatments are presented for comparison. Although observations were made after each spray application, data are presented as pre- and post-treatment averages to summarize results. Aphids – There was more than a fivefold increase in untreated control during the treatment period. 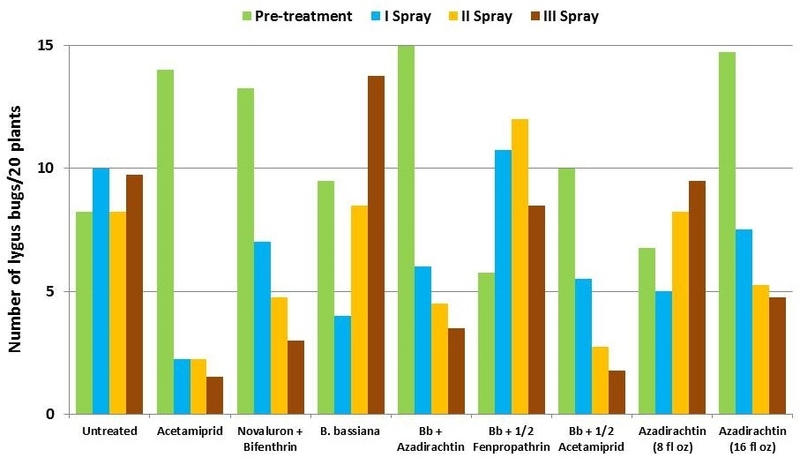 During this time, acetamiprid caused nearly 78% reduction and the combination of B. bassiana and half the label rate of acetamiprid caused about 44% reduction in aphid numbers. Among the remaining treatments where aphid populations increased, the combination B. bassiana and azadirachtin limited the increase to 19%. Lygus bugs – Total number of nymphs and adults was similar in untreated control during the experimental period. Acetamiprid caused an overall reduction of 86% in lygus populations from three spray applications. 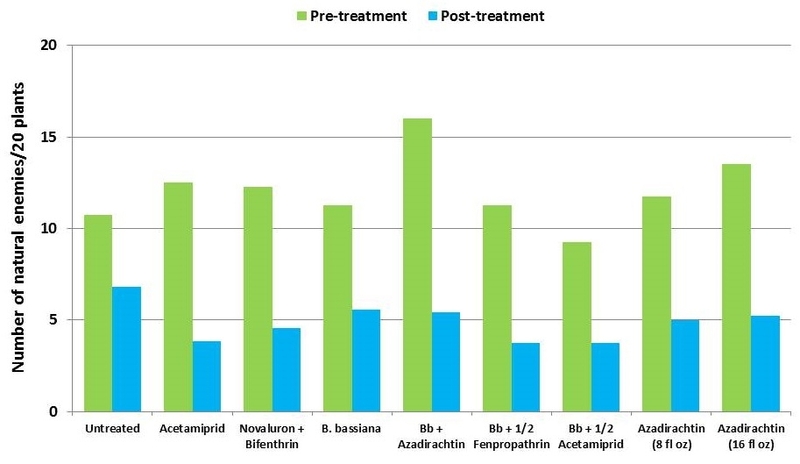 Beauveria bassiana caused 58% reduction in lygus numbers with the first application and only 11% with the second one. It could not limit increasing numbers afterwards. 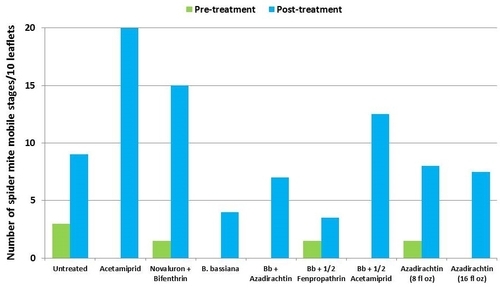 However, the combinations of B. bassiana with azadirachtin and acetamiprid caused nearly 70% reduction in lygus bugs. While the lower rate of azadirachtin was similar to untreated, the higher rate caused a 60% reduction in lygus numbers. Twospotted spider mites – In general, mite populations were very low during the observation period with some increase after the treatments were initiated. Not having a chemical miticide in the study limits meaningful treatment comparisons. 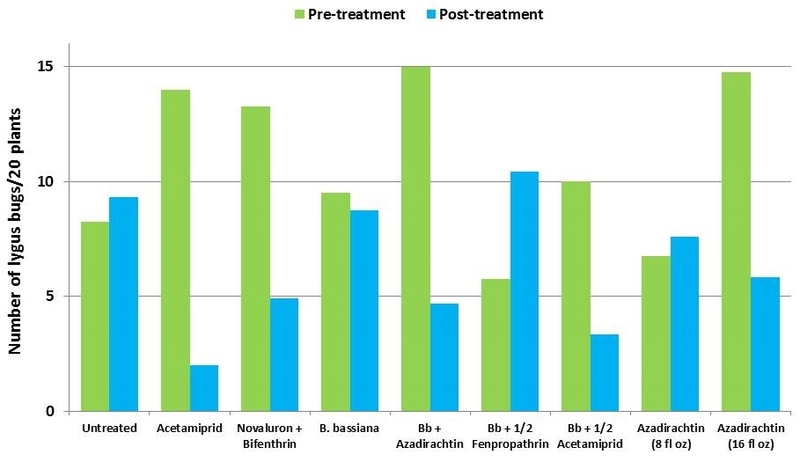 While no treatment caused a reduction in mite populations, the combination of B. bassiana and azadirachtin seemed to limit the increase in egg numbers and the combination of B. bassiana and half the label rate of fenpropathrin limited the increase in mobile stages. Thrips – There was more than a threefold increase in thrips numbers in untreated control during the observation period. 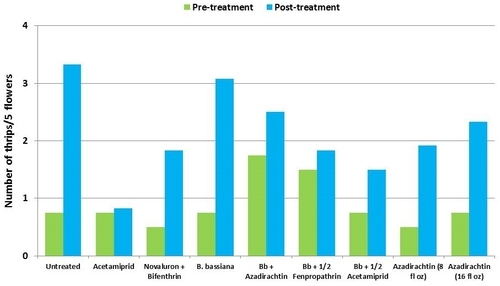 Their numbers also increased in treatments, but it was relatively less in acetamiprid followed by the combinations of B. bassiana with the reduced rate of fenpropathrin and azadirachtin. Whiteflies – There was a general reduction in whitefly adult numbers during the observation period. Compared to other treatments, acetamiprid alone and along with B. bassiana seemed to cause more reduction although it was not statistically significant. Natural enemies – All species of natural enemies were combined for the comparison. There was a general decline in their numbers during the observation period. Although not statistically significant, the reduction appeared to be limited in plots treated with B. bassiana and azadirachtin compared to other treatments. Although statistically significant differences among treatments could not be found with all pests, a large scale field study such as this demonstrates the potential of B. bassiana and azadirachtin in strawberry IPM. These materials help reduce the chemical pesticide use and the risk of pesticide resistance when substituted for one or more chemical treatments. 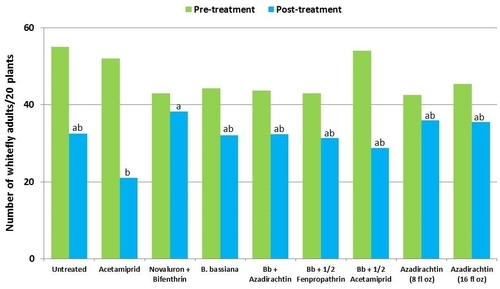 Additionally, B. bassiana can improve the overall pest management when used in combination with chemical pesticides and ease the challenge of controlling lygus bug with chemical pesticides alone. This study clearly demonstrates the potential of microbial and botanical products in strawberry IPM and warrants additional field studies. Thanks to Dave Peck, Manzanita Berry Farms, for his collaboration and valuable support with this study. I also acknowledge the financial support of BioSafe Systems, Bioworks, Inc., Chemtura, and United Phosphorus which made this research possible. Dara, S. 2011. Exploring the potential of an entomopathogenic fungus for strawberry pest management. CAPCA Advisor, October issue, pp 28-33. Ludwig, S. W. and R. D. Oetting. 2002. Efficacy of Beauveria bassiana plus insect attractants for enhanced control of Frankliniella occidentalis (Thysanoptera: Thripidae). Fla. Entomol. 85: 270-272. McGuire, M.R., J. E. Leland, S. K. Dara, Y.-H. Park and M. Ulloa. 2006. Effect of different isolates of Beauveria bassiana on field populations of Lygus hesperus. Biol. Control 38: 390-396. Pearsall, L. A. and E. J. Hogue. 2000. 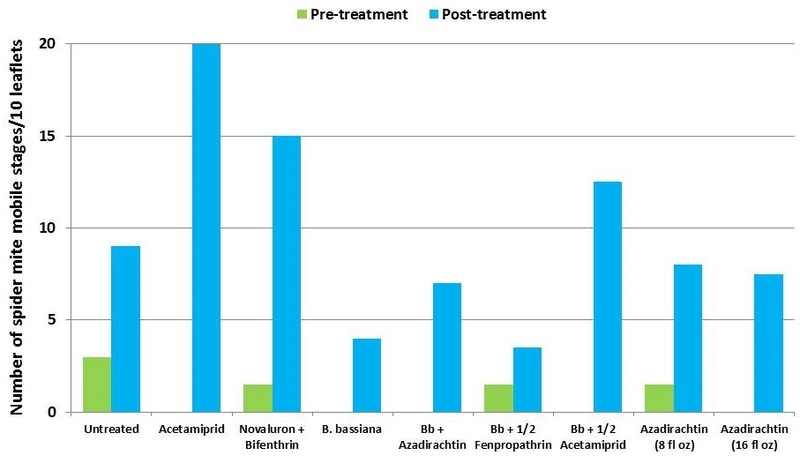 Use of azadirachtin as a larvicide or feeding deterrent for control of western flower thrips in orchard systems. Phytoparasitica 28: 219-228. Quesada-Moraga, E., E.A.A. Maranhao, P. Valverde-García, C. Santiago-Álvarez. 2006. Selection of Beauveria bassiana isolates for control of the whiteflies Bemisia tabaci and Trialeurodes vaporariorum on the basis of their virulence, thermal requirements, and toxicogenic activity. Biological Control 36: 274-287. Shi, W-B., L-L. Zhang, and M-G. Feng. 2008. 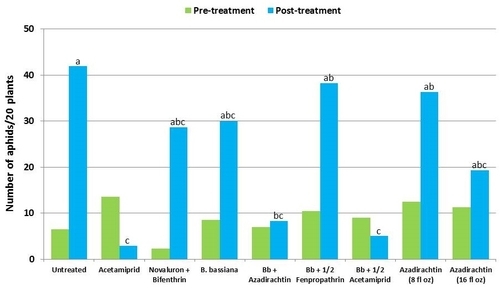 Field trials of four formulations of Beauveria bassiana and Metarhizium anisopliae for control of cotton spider mites (Acari: Tetranychidae) in the Tarim Basin of China. Biol. Control 45: 48-55. USDA-NASS. 2012. California agricultural statistics. 2011 crop year. Von Elling, K., C. Borgeneister, M. Sétamou, and H.-M Pehling. 2002. The effect of NeemAzal-T/S®, a commercial neem product, on different developmental stages of the common greenhouse whitefly Trialeurodes vaporariorum Westwood (Hom., Aleyrodidae). J. Appl. Entomol. 126: 40-45.